Drop side cribs illegal to manufacture, sell, or even donate in the US. All cribs sold in the US—new or used—are now subject to the most stringent safety standards in the world. That’s the goal of the new crib safety standards put in place on June 28, 2010, by the US Consumer Product Safety Commission (CPSC). This is a “great victory for consumers,” according to CPSC Commissioner Robert Adler. The new standards were first voted on in December 2010 in response to serious infant safety concerns related to drop-side cribs. Since 2000, 32 infant suffocation and strangulation deaths were associated with drop side cribs. According to the CPSC, and over 11 million cribs have been recalled in the US since 2007. 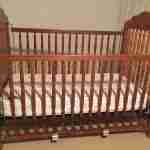 All cribs for sale in the US must comply with new rules or be removed from store shelves, including drop side cribs. This includes secondhand stores and children’s consignment shops. However, childcare facilities, including family childcare homes and infant Head Start centers, as well as hotels and motels, and rental companies have until December 28, 2012, to phase in cribs meeting new crib standards. Banning drop side cribs in favor of standard, fixed-side cribs, the new standards call for strengthening mattress supports and crib slats. In addition to requiring crib hardware to be more durable, and safety testing is more rigorous. “A safe crib is the safest place for a baby to sleep. It is for this reason that I am so pleased that parents, grandparents, and caregivers now can shop with confidence and purchase cribs that meet the most stringent crib standards in the world,” says CPSC Chairman Inez Tenenbaum. “From the start, our goal has been to prevent deaths and injuries to babies in cribs. Now the day has come where only stronger and safer cribs are available for consumers to purchase,” adds Tenenbaum. In addition the CPSC has promoted a campaign "Bare is Best". This promotes babies in cribs with a fitted sheet and nothing else. No toys, pillows, bumpers (padded or breathable), and no blankets. Current safe sleep for babies is to swaddled rather than having loose blankets that can possibly pose a suffocation risk. Thus, all drop side cribs are illegal in the US.